If you’re keen to bring your baby up on a diet that’s as natural as possible, how easy is to find additive free baby food? E numbers and additives are creeping into a wide range of food and drink products in the UK and baby food is no exception. Babies begin to start weaning from about the age of four to six months old, starting off with simple foods such as mashed apple, carrot or banana, before progressing to other textures, such as rice, pasta and meats. To make life easy, there are a wide range of baby food products on the market, but not all are equal. Although, in theory, baby food products are made up of simple ingredients, such as fruits, vegetables, rice and pasta, as they’re likely to be on the shelf for a while, some do have extra ingredients to help preserve their shelf-life and longevity. Others may even have a tiny amount of colour added, to improve their colour, or a thickening agent to bulk up the food and improve its overall look. For parents wanting to give their baby a natural start in life, it’s these added ingredients they may not be quite so welcome in baby food. Some manufacturers have cottoned onto this factor and have introduced some excellent ranges of organic and natural baby foods, containing no unwanted additives and E-numbers. If you want to buy ready made baby food, for example for ease of use, then it’s certainly worth shopping around and looking at the labels to see how different products compare. If you do find ingredients appearing on baby food labels that you’re not sure about, then it’s always worth questioning it with the manufacturer. These days, E numbers are often not listed in their E prefix format, with manufacturers instead providing the full chemical name. This can be confusing and a bit misleading when you’re trying to avoid additives, so there’s no harm in finding out what things really are. In some cases they may turn out to be harmless, but when you want the best for your baby, it’s worth double checking. 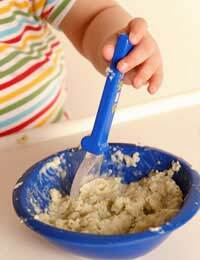 For the ultimate in additive free baby food, then you can’t beat making your own. By buying fresh fruits and vegetables, cooking them, mashing them or pureeing them together, you can be completely sure that your baby isn’t being subjected to any sneaky E numbers of additives. It can be a bit more work, but needn’t take long to puree some ingredients together and provides peace of mind for the keen additive avoiders. If you’re really conscious about what you eat, then choosing organic or locally grown produce, which hasn’t travelled an excessive number of air miles to reach your location, is a good option. Once mashed or pureed, homemade baby food keeps well in the fridge, or you could be even more organised and pop individual portions in the freezer, ready for when you need it. If you want a pure, natural and organic diet for your baby, it’s relatively easy to achieve during the very early years. Unfortunately, it’s as they get older, expand their diets and get to see the variety of different foods and drinks available in the supermarkets that it becomes harder to protect them from E numbers and additives.